Live and Loud! started in 2012 with a show by Depeche Mode, so it seems fitting that the 100th live show remaster is also by Depeche Mode! 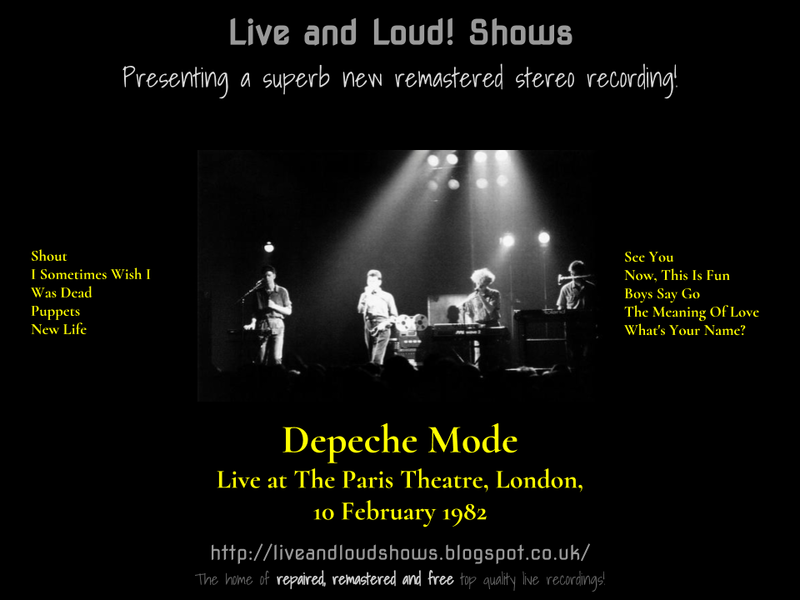 This time, a show recorded for the BBC back in early 1982 and the 3rd show I've done lately that was originally recorded for the Live In Concert series at the Paris Theatre (Dramatis and Fatal Charm being the others). Like those, this is about half an hour long and comes from a point when Alan Wilder had just joined the band after Vince Clarke left. Featuring a mix of tracks from Speak and Spell, b-sides and 2 new tracks, See You and The Meaning of Love, this recording has had some noise removed, a couple of defects fixed and then EQ applied to make it sound nice and clear and bring out the bottom end a bit so the kick drum actually kicks a bit. The show is available to download here as 1 MP3 file. Or, if you would like to have separate tagged MP3s, or even lossless files in FLAC format, head on over to the Donations tab to see how you can obtain these for a very small donation towards the site costs. A fine recording of a, well, perfectly adequate gig. I recorded this off-air all those years ago and it didn't take me long to realise that, although I enjoyed DM's synth-heavy sound, musically they were considerably inferior to the support act, Talk Talk. And I still feel that way now. Yeah I did too, at the time. I agree at the time they were quite primitive and singalong pop oriented. Nothing sophisticated really - but comparing 1 band against another is a bit like comparing eggs with sausages though; 2 different things. Thanks for listening!